This image, in approximately the same orientation as the reconstruction below, came from a six page article on The Britsh Museum web site called Eridu visit and photos, posted June 2008. 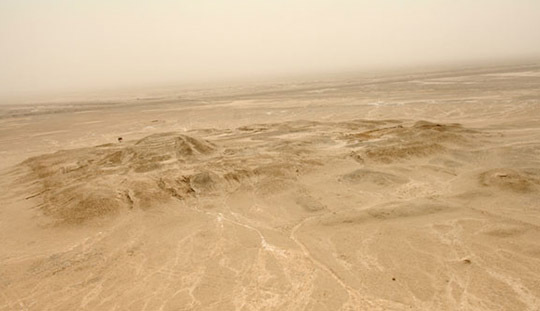 It shows the effect of time and weather on the clay buildings of Uruk. Unfortunately, that article is no longer available. Uruk visualisation project. 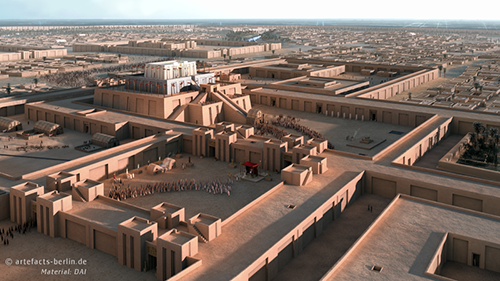 This beautiful artist conception of Uruk, showing a procession to the temple on the ziggurat, comes from Artefacts Scientific Illustration and Archaeological Reconstruction. The image has been reduced to fit our page. Visit the Artefacts site to see an enlarged version and to read more information.